Black Friday madness is on us again and I for one would rather go down the pub this evening for a quiet pint than wrestle with a bunch of greedy grabbers behaving like hooligans looking for a pre-christmas cheap deal. It's just not worth the agro! But what bothers me the most right now is the fact that I can't escape the publicity surrounding Black Friday. In particular, there's the fact that my email inbox is, and has been for the last few days, full of emails from various companies all with the heading "Black Friday discounts.. blah blah blah..." and "Black Friday sale just got bigger....". So what's wrong with that you might be thinking? After all you're getting a discount and that can't possibly be a bad thing. Well no, money off something isn't usually a bad thing, but it's the timing that annoys me. What about the rest of the year? How about having a few discounts on products in March or August for example? Or even better still (and this is the option I'd prefer), how about just having slightly lower prices throughout the year without a massively publicised sale in one week in the run up to Christmas? 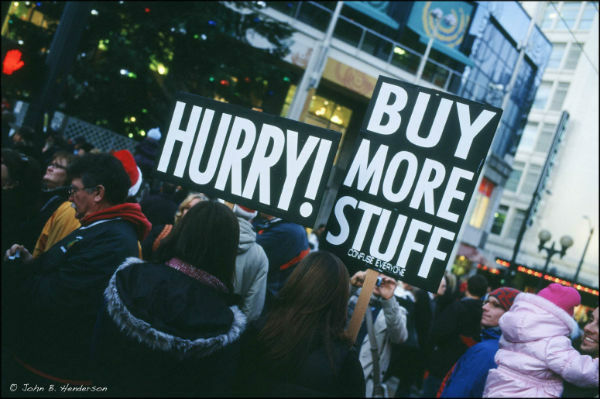 We can all do with some help with the expense of Christmas, but rather than save money I think the Black Friday sales are more likely to entice people to buy stuff that they don't really want or need. This in turn may may end up forcing the least wealthy and most vulnerable into the cycle of debt. You get the idea? Here's an idea. Black Friday and Cyber Monday - tell them to stuff it by keeping your hand in your pocket and your wallet locked up tight! After all, there's no such thing as a free lunch and it's just the big greedy companies and their fat, overpaid bosses that will benefit. It's once more the Xmas/Thanksgiving/Black Friday/New Year/Channuka season which has now begun to haunt us yet again. How sick I am of the commercialism, the Xmas tat, Xmas grub, Xmas garbage everywhere. Black Friday is followed by Black Monday when you find that your bank account has been emptied by capitalist greed. Same goes for sales on Boxing Day!